Home » Health Policy » Advance Directive in end-of-life care. Advance Directive in end-of-life care. Dr Babu Paul (IAS Retd.) was the chief guest at the Palliative Day observance at Caritas Hospital, Kottayam last week.He talked about palliative care with respect to the ethical aspects involved. He disclosed an advance directive which he had made for himself. 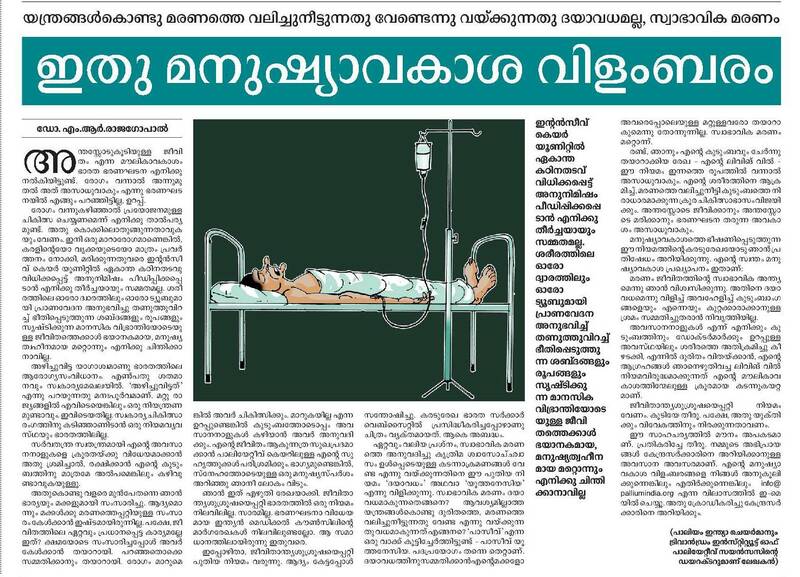 See video excerpt below (~ 2min, Video courtesy Dr Manu John, Palliative care Dept, Caritas Cancer Institute, Kottayam). I am 72, going on 73.I am happy in my current situation but ready to be called home by my creator any time now. I therefore make the following wish list. I may not be kept alive by artificial life support systems except as a purely temporary measure up to 6 hours and for unavoidable medical reasons. I should not be resuscitated….. In Summary the doctors are allowed to undertake comfort measures. I would prefer not to be shifted to any hospital….No artificial or IV feeding at all. May my body go in peace and my soul rest in peace. As advance directive in mental health care is being introduced in India by the new act, it needs to be remembered that we are only at a stage of advance directives slowly evolving even in end-of -life care in our country. By kumarRam in Health Policy, Mental Health Policy on January 23, 2015 . I am also of same age . I appericate it .My last wish is also exactly same !! Prolonging the life it is beyond the natural way .. I believe that the process of aging and phenomenon of death can not be prevented .. Thanks Sir for the comment. Now that we have reached the stage where people will have an option to express their decisions regarding end-of-life care, the next step will how to operationalize such expressed wishes in the health system processes. I am 67 years old and I also believe that ICU care for the elderly is a severe punishment; advance directives are a very good way of preventing doctors playing havoc with our bodies. All that most of the elderly want is a pain free and peaceful death. I also want to make advance directives; but what is the legal status of such directives? Are doctors in India bound to honor the directives ? Sir, Thanks for the comment. As of now advance directives have limited status I India as the concept is still evolving. It does seem to have a role in facilitating communication between doctors and the elderly person during end of life care.